It has been few days since the eruption in Holuhraun has ended and everything is quiet for the moment in Bárðarbunga volcano. What is going to happen next is a big question and nobody has the exact answer. Here are few options. Nothing is going to happen. The rift is going to continue without more eruptions. New magma intrusion is going to start soon in Bárðarbunga volcano. New eruption is going to start days to weeks later. There is also high risk in my view of eruptions in Hamarinn volcano (also called Loki-Fögrufjöll). That volcano system is inside Bárðarbunga volcano and dyke intrusion from Bárðarbunga to the south might start a volcano eruption in it. I don’t know how big such eruption would be, it is my estimate. Dyke to Torfajökull volcano is unlikely to happen. I however cannot rule it out at this point. What is going happen in Bárðarbunga volcano depends on many factors and not all of them are known. What is known is that heat has been increasing in shallower parts of the crust and caldera for the past six months and those signs are not good. What is not known is the time in question. Next eruption could happen tomorrow or nothing can happen for years. There is no way to know when next eruption is going to happen. Currently I am just monitoring Bárðarbunga volcano and waiting to see what happens next. The text above is just speculation, not fact. It is not clear what is going to happen next. The only way to know that for sure is to wait until next eruption starts and that might be a long wait. This entry was posted in Bárðarbunga, Dyke intrusions, Fissures, GPS data, GPS Monitoring, Hamarinn, Monitoring, Volcano. Bookmark the permalink. If you look at the associated drumplot you can see the data is intermittant with a spike each time the data starts again. I think that the ‘tremor’ is just a fault in the accelerometer. The von drumplot looks sensible though. You read my mind I was just going to ask if this was weather related.? There has been really bad weather in Iceland today. With wind gusts up to 55m/s. Do any of the other stations in the area show that kind of activity? Bad weather has happened in the past, and I do not remember anything quit like that showing up? Speculation on my part, Bardarbunga will most likely erupt given the amount of activity there, but when is anyone’s guess. Geological timeframes are much longer than ours. Looks like a few quakes this morning . I’ve been looking at the GPS around Iceland and the one that currently stands out is Skrokkalder, southwest of Tungna for those unsure of where it is. That sits on the Tungna system. There was a gap in its output in mid Jan, after which the height was significantly up. It may have been manually moved, I don’t know. If it was, then it’s too early to say if it is significant. If it wasn’t, then it stands out bigtime. Also, Jokulheimar is worth watching. It’s on the southwest tip of Vatna and is sitting on the Bardar system. It shifted a lot with the recent eruption, dropping down at the end of the eruption and now looks like it could be rising – too early to be sure. It appears that the SIL station Skrokkalda got damaged in the last storm. It is not updating at the moment. Edit: Comment link fixed. – Jón Frímann. Yes Jon, you have long said it may go south and I see your logic. If bb itself does not erupt, then I have long thought tungsnafellsjokull, my reasons being the continued high tremor at von and dyn, and it being in the midst of GPS lateral movement. Given askja raising questions before the holuhraun and the locus of eqs either side it is possible the systems could converge. Meantime, waveform readings have been visible on burfell and Hella strain gauges for over a week now and given IMO warnings last year I would never be inclined to take Heklas rest for granted. Absolutley no harm in guessing/ speculating what might happen next, you may just stumble upon something in the process. Two storms expected in Iceland tomorrow and until Friday. This are going to be bad storms, mostly the second one far as current weather forecast is at the moment. There is going to be extremely bad weather on Saturday. If you are in Iceland and reading this do not travel at all until the weather gets better that day. Please check the broadcast of Radio Iceland if you can reach it. They broadcast on FM 89,1 Mhz in Reykjavík area. First green star in a long time! I don’t understand why this quake shows such a remarkably big spike in Gygarholskot tremor plot? That is located south of Langjökull – pretty far away from quake location. I am wondering, with the very bad weather, are we seeing all the small quakes that are happening, and with the last large (green star) quake, is that really the correct magnitude of that event? No, the IMO need time to manually process the small eqs, the larger M3.1 will also be corrected if need be. The subsidence data is also corrected and based on best knowledge of mitigating factors, such as ice movement. Corrected data is accurate within 10cm when there is scatter or considerably less when location is good. Info courtesy of IMO crustal deformation specialist. Thank you for your help, Scots John. Hoping the weather settles down in Iceland soon. There is new storm coming. There are going to be few hours with quiet weather until around 16:00 UTC tomorrow. Then I hope this is the last storm for the next four days at least. Interesting radar picture on the blog of volcanologist Haraldur Sigurðsson: http://vulkan.blog.is/blog/vulkan/entry/1656134/ It was taken on Mars 3, 2015, by DLR (German Aerospace Center). The ice cauldrons – in the meantime 5 of them within the caldera of Bárðarbunga – are clearly to be seen. Interesting to see the changes in the central volcano, compared eg. 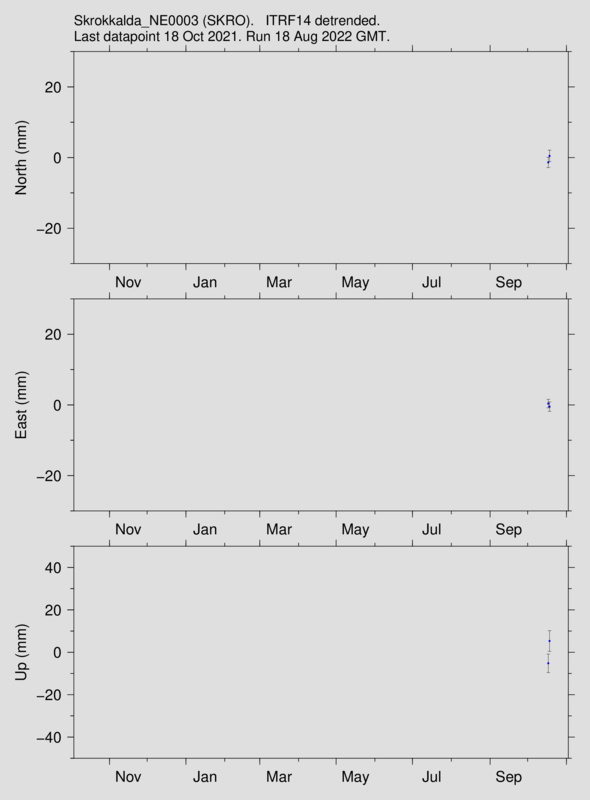 to the satellite pictures of August 2014 ( http://jardvis.hi.is/bardarbunga_agust_2014 (scroll down to: 23. Ágúst 2014, there is also an old picture there from 2000) . Today, Sunday 15. 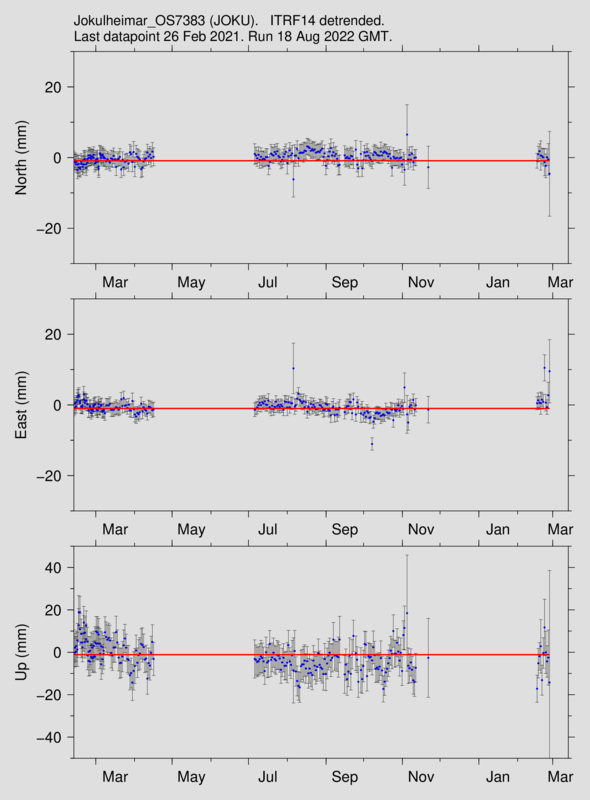 March, at 18.10UTC, an unusual seismic event happened at Grimsfjall-station. On this IMO-plot, it took nearly 1,5 hours to calm down again. A tiny spike can be seen on some other stations, too. For me it looks like a landslide, or, in winter, maybe an avalanche? But here on top of Vatnajökull? It rumbled for a uch longer time than normal eq. “It’s probably just the wind”? comment above was directed at the IMO plot on top. not fully serious to start with, but it wouldn’t surprise me if a strong local gust of wind caused it. second one, I have no idea. Something cracked and created a chain of events. Could be due the warmer weather a melt pool has formed and the seimometer registers the emptying over a waterfall or so. It could take weeks before someone passes by. I am sorry for this a bit frustrated comment. I can’t for the life of me live in Iceland. I’ve already been here for four months and I am already getting crazy regarding living in Iceland. I miss living in Denmark and everything about it. For that reason I am going to move back there soon as all debts are paid and I have collected enough money to move back. Since I have to own money for the transport cost, air fair, insurance for an apartment (rental) and some furniture. I won’t be living high in Denmark on my current income (8.562,51 DKK, 1.147,77€ and -1100 DKK, 147,45€ Danish tax since tax in Denmark is ~15% higher than tax in Iceland). For good live in Denmark I am missing about ~1500 DKK / 201,07€ a month. I am going to start writing short stories soon and publish them on Amazon. I hope that gives me the extra income to live in Denmark without much problems. Donations are also welcomed for this, if you want to support me moving back to Denmark specially, please say so in the text box so I can move that amount to the bank account I have set-up in order to save up for the move back to Denmark. I am sorry for this comment, I just have to express my self on this matter. A book would be good, with good photo’s of Iceland and its volcanoes, the semi permanent weather depression between Iceland and Greenland, etc. You have been doing this for a good while and people would appreciate knowing how to read the signs and data, the terminology, I think you could put a good book together and you may get backing from the Iceland tourist board perhaps? I don’t write nature books. I am more into fiction and adventure stories. Here is one of my first published short stories. Here are my free stories. Maybe gradual glacial changes is all that will be observed now.This is now a geothermal event? ALERT: G4 (severe) geomagnetic storm in progress. Widespread power grid problems possible, triggering large outages. GPS outages may occur. Kp wing index is at its max!!! Big time aurora possibilities, if only the night sky was clear. Wind in the storm last Friday had the force of 1 stage hurricane. With average wind speed going up to 32,7 m/s. [b][color=red]The #solarstorm is staying strong southward. It could reach G5 storm level. I agree with the NOAA Wing-Kp prediction! I sprayed my aluminum hat bright green for today. Not related to Iceland geology. K8.6, if that is right i could see the aurora from Somerset! Light cloud at the moment though, hope it clears & cross fingers! Take this discussion else where. Tyler, please don’t be a grump, this is big and important news. Has Jon made you a moderator on this forum? Still communication failure with vertical at bard i see. Please do not troll or fight in the comment section. Thanks. Those how do might find them self being moderated without warning. I understand that there is a direct relationship between the Earths core and the Earths magnetic field – is there also a relationship between the mantle and the magnetic field? The interesting point being that magnetic metals give up their magnetism when heated! The earth is somewhat more complex. Not only do these hot spots exists, we also have magnetic anomalies in the lithosphere. Many of these are listed on shipping charts since they affect compasses. Then you have the fact that the magnetic poles are moving, and not concentric to the true poles. Historically the poles ave shifted, reversed, around 170 times, and the earths poles are becoming less stable – meaning the shifts are happening more often in geological terms. This affects us because it is one of the factors that protects us from solar radiation. That does not mean it is going to happen now, the cycle is now though to take 200,000 years or so, instead or several million years. Pole shift has been monitored since the advent of mans instruments and the shifts are taught to navigators using charts. So what (if any) effect would a strong geomagnetic storm have on the lithospheric magnetic field? The current CME affecting Earth is one of the most powerful yet, our magnetosphere is protecting to us a degree, whilst being somewhat disrupted, that intense disruption allows solar plasma through the field. That disruption is evident through the aurora’s that happened last night and will again tonight. Ham radio enthusiasts noted a disruption to long range communications at the time the storm entered our magnetosphere. Slooh Community Observatory will webcast live views of the aurora from Iceland tonight. You can watch it directly through Slooh or live on Space.com. Looks like Von station is teeming with small EQs today? Tremor stn is also hinting at an increase in activity today, I believe. I do not see what you are seeing?Looks relatively settled? Each time a spike is followed by extended rise in the red signal, which indicates possible magma flow. There were three similar almost periodic pulsations in the past few weeks. Something is happening under the ice. Might not be very much, but its there.